Our fee’s are clear and transparent. You simply pay a flat interest rate of 1.85% of the funded amount per monthly installment. Eg. Funded amount x 1.85% = the interest you pay every month you have the loan. It works out to be cheaper than most credit cards. Yes, a one-off setup fee is added to the first payment. (If your application is declined no application fee is charged). The setup fee is detailed in your application documents and is dependant on the industry type. What term can I spread payment over? You can choose to spread payment over 3, 6 or 9 months depending on your industry. Can I spread payment over a longer term? No. We specialize in short term loans. Can I pay it off early if I choose? Yes. You can settle your loan in full at anytime by simply contacting us arranging to do so. Are there penalties for paying it off early? Most of our loans have no charges for early repayment, however a few special type loans have a small fee for early repayment. Please check your loan documentation for further details. The great news is that you only pay interest for the period you’ve used the loan. Can I have more than one loan with Fee Funders at once? Once a loan is in place, it’s difficult to alter the funding figures, so the easiest way is to start a new loan for the added amount and to have two loans running in parallel. Can I get a private loan from you? No. 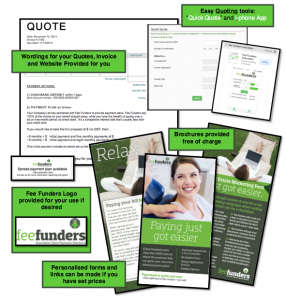 Fee Funders fund fees from approved service providers. If you have an invoice you’d like funded, ask the supplier to contact us and we can arrange to sign them up to our service so you can fund your bill of theirs through us. It’s a win/win for both of you. Do you credit check me? We randomly credit check. You may or may not be credit checked depending on various factors (such as the amount borrowed etc) Expect to be credit checked, yes. When will I know I’ve been accepted? With our instant online processing your application is processed and setup ready to go from the moment you press the “submit” button. Assume you’ve been approved unless we tell you otherwise within 24 hours. How do you take the money from me? All payments are made via monthly Direct Debit. The first payment starts one week after the signup date and continue monthly after that. Can I pay weekly or fortnightly instead of monthly? At Fee Funders we work on monthly payments only. Our systems are robust and we have a dedicated Direct Debiting team that manage all payments. The computer system knows when your payment is due and “notices” if it misses. It will automatically send you a text message to say that your payment missed and will give you details on how to catch up and make payment. If I miss a payment does it automatically affect my credit rating? Not usually. We understand that sometimes life happens and we do all we can to work with you to ensure your payments are caught up to date and manageable for you. What if my bank account changes? Simply contact our Direct Debiting team and they can update it for you to ensure your payments continue uninterrupted. Who do I contact to query my loan or discuss payments etc? You will be given full contact details of our Direct Debiting team once your application has been submitted/approved. Who does Fee Funders pay the money to? We pay the money directly to your invoice supplier 5 working days after your first successful Direct Debit payment. What if my invoice provider isn’t signed up to offer Fee Funders payment option? We can only fund the invoices of companies who have signed up with us. If you’d like to fund an invoice from a company that is not yet one of our clients please suggest they contact us on 0800 333 729 or [email protected] and we’d be happy to show them the benefits of signing with us. (it’s free for them to do so! )… or let us know their details and we’ll follow them up for you. What happens if I am unhappy with the services of the provider who’s invoice I’m funding – can I stop payments? No. Your relationship with your service provider (who’s invoice you’re funding) is separate to your funding relationship with us. If you are unhappy with your service provider, although unfortunate, that doesn’t negate your responsibility to honour your loan repayments. Eg. Just like a house or car loan, if your car breaks down or your house burns down, it doesn’t cancel your mortgage/car loan. Are you just like a credit card? No, we are not a credit card. We are structured differently. Credit Card companies aim for you to have a balance owing for as long as possible (that’s where they make their money!). We are short term loan providers. We WANT you to pay your loan off. It is a specific loan for a specific reason – unlike the open-ended nature of credit cards. What amounts can you fund? We fund fees from $1000 – $25,000. What terms do you spread payment over? Your customer can choose to spread payment over 3, 6 or 9 months with us. Yes – we specialise in short-term loans, but some of our Clients required longer terms and we’re happy to help. History and experience do however show that 6 or 9 months is the “sweet spot” for safe lending terms. Does it cost to sign up with you? No. There is ZERO cost to you, the business owner. It is free to sign up with us, and free to use our services. How does Fee Funders make their money? We make our money from the interest charged on the loan to your customer. The person who’s spreading payment of your invoice pays the interest – not you. What is the interest rate and how is it calculated? We charge a flat interest rate of 1.85% of the funded amount per monthly installment. Eg. Funded amount x 1.85% = the interest charged every month they have the loan. Yes, a one-off setup fee is added to the first payment. (If an application is declined no application fee is charged). The setup fee is include in your application and is dependant on the industry type being funded. Are the interest rate and the application fee the same regardless of the amount funded? Yes. The interest rate and the nominal setup fee are the same regardless of the amount being funded. Are there penalties for paying the loan off early? Most of our loans have no charge for early repayment, however a few special type loans have a small fee for early repayment. Please check with us for further details. The great news is that your customer only pays interest for the period they’ve used the loan. Are you similar to a credit card company? No, we are not a credit card. We are structured differently. Credit card companies aim for people to have a balance owing for as long as possible (that’s where they make their money!). We are short-term loan providers. We WANT our Customers to pay their loans off. It is a specific loan for a specific reason – unlike the open-ended nature of credit cards. Do you do Interest Free transactions? We assume you want full payment of your invoice. Somebody has to pay the interest – and our business model is set up so that your customer, not you, pays for the convenience of using our money to spread payment of your invoice. If you wish to use “interest free terms” as a sales tool in your business that is something between you and your customer and we don’t get involved. Why is using Fee Funders a good alternative to Credit Cards? It gives your customer choices. Many people may not wish to, or be able to pay your invoice on credit card and having a cost effective, easy spread payment alternative makes good financial sense for the cash flow of both you and them. Fee Funders is strictly a short term loan facility to cover a specific invoice. A Specific Loan for a Specific purpose. When do I (the business) get paid? We pay you 100% in full, 5 working days after the first successful direct debit from your Customer. When does my Customer make their first payment? Payments are made by monthly Direct Debit. The first payment is automatically set to start 7 working days after the date of application. (The start date can be changed to a later date if you and your Customer jointly decide, but bear in mind that you don’t get paid until we’ve got the first payment…so if you agree to a later start date you’ll be waiting longer for your money). Can we make the first payment date sooner than 7 days? No. Legally we can’t make a Direct Debit start sooner than 7 days. If you wish to be paid earlier, you may consider asking your Customer for a deposit upfront and then funding the remaining balance. Can my customers pay weekly or fortnightly instead of monthly? Our software works it out on monthly payments and the first payment needs to be the monthly amount. On special request we can change the frequency after we have received the first payment. What’s the process for payment defaults? When will I be informed? If a scheduled payment misses your customer gets an automatically generated friendly text message to inform them and give them options for ways to make payment. If they don’t proactively make payment within two days a friendly staff member will phone them and work with them to reschedule the payment. It is in everyone’s best interests that the lending agreement is honoured so we work with the customer to achieve the win/win in every situation. Weekly reports are generated showing the status of all clients and payments and you can log in to our online portal to check status of your customer’s payments anytime. You have full access to payment status/information of your Customers through our “Customer Reporting” portal from your personalised login. This enables you to see if any defaults and we can work together to ensure they are resolved quickly. In our experience, less than one in 150 lending agreements “go bad” – most clients pay beautifully and seamlessly. Are there penalties for missed payments? If your customer defaults on payment we do everything in our power to contact and work with your customer to resolve the situation and reschedule the payments. On the rare occasion that the money isn’t recoverable off your customer we recover the unpaid portion back from you. We don’t charge any penalties for the inconvenience or the lost interest we are missing out on – it’s strictly the unpaid principle balance left that you repay. It is then your responsibility to pursue your customer for the outstanding amount. Will I be told if there are payment problems? Your online portal will enable you check up on your customers at any time. Only when if we have an obvious potential problem will we bother you and discuss the best way forward. It’s in everyone’s best interest that your customer pays as agreed and all care and effort is taken to ensure this happens. What’s the Catch / Pitfalls to be aware of? We aren’t taking the risk away from you – you still need to do business with high caliber clients who will meet their payment obligations. If your client defaults on payments you are liable for the unpaid principal balance…. But only the unpaid principal… not the interest or fees. Our payment options (3/6/9 months)- research and experience shows that this is a very “safe zone” for lending. ie. If we credit check your client today, we can be confident that in 6 months their financial situation will be largely the same…in 9 months, still likely to be similar…. but in 12 months? – all bets are off – it may be a TOTALLY different financial picture. We credit check most customers – this protects you. If one of your customers wants to spread payments and a credit check shows up something “iffy” that makes us uncomfortable lending to them – wouldn’t you like to know? If one of your customers is refused lending because we’re not sure they’ll honour their payment commitments, then you might want to consider your decision to do the work/sell your services to them? Our Direct Debit system – Direct Debit is great because it puts you in control. We can in effect, TAKE the agreed money. Our Payment monitoring system – we have a dedicated specialised team that monitor the payments. It is seamless and automated. If a scheduled payment misses it is noticed immediately and steps taken to re-schedule the payment. Most companies find that the benefits outweigh this small risk and they realise that our involvement helps mitigate the risk of non-payment more than if we weren’t involved. Do you Credit Check Me? / My Customers? Yes. In most cases we credit check customers before agreeing to fund them. It’s in everyone’s best interest that payments can be made. We randomly credit check customers before accepting their application for fee funding. Most customers pass and we are happy to offer our services to them. On the rare occasion that we refuse an application you will be informed as to the reason why and then you can make an informed decision regarding the work you do for your customer and the payment terms you agree upon. We also credit check your company when you apply to sign up with us. How will I know if it’s approved? Assume it’s approved unless you hear otherwise within 24 hours. We will inform you and your customer within one business day of application if your customer fails to meet our lending criteria. If an application from your customer is not approved you will be the first to know and we will decide together on advising your customer. Can the same customer have more than one loan with Fee Funders at once? Yes, subject to approval. If you have more than one invoice owing for the same customer you can fund them together in one lump sum. How do you treat my Customer? Rest assured that we treat your customer with the utmost professionalism and respect at all times. We stake our reputation on it. What is the process for signing up with Fee Funders? Simply complete and return email our Client Agreement Form. Your application will be processed within one business day. How much help do we get from you? As much as you need! Looking after our Clients is important to us and we go above and beyond to ensure that you have all the help and tools that you need. We want you to use us….. and we know you’ll only use us if you if it’s really quick and easy for you to do so! What is the process for using you with my Customers? It’s EASY and takes you less than 3 minutes online. Simply log into www.feefunders.co.nz with your user name and password and complete the quick and easy online form to generate the lending documents. With the push of a button the simple and clear paperwork is generated and emailed to your customer for online completion. (It takes them less than 5 minutes for them to complete). There is also an option for manual completion of paperwork.